Those seeking an industrial vibe in the bedroom will not be able to resist the charm of the Urban 1 Drawer Bedside. The rustic finish adds to the industrial design, complimented perfectly by the metal frame and wood finish effect. Contemporary homes will appreciate the modern design of the Urban 1 Drawer Bedside. This is a bedside table that provides a suitable area for lamps, alarm clocks, mobile phone chargers, books and other bits and bobs that personalise your bedroom. The drawer is the perfect size to provide essential storage, ideal for smaller bedrooms. The Urban 1 Drawer Bedside comes with plenty of storage options, all covered in the rustic wood effect finish. The table top and drawer allow for plenty of stage space, but the extra shelf area below the drawer gives extra options. 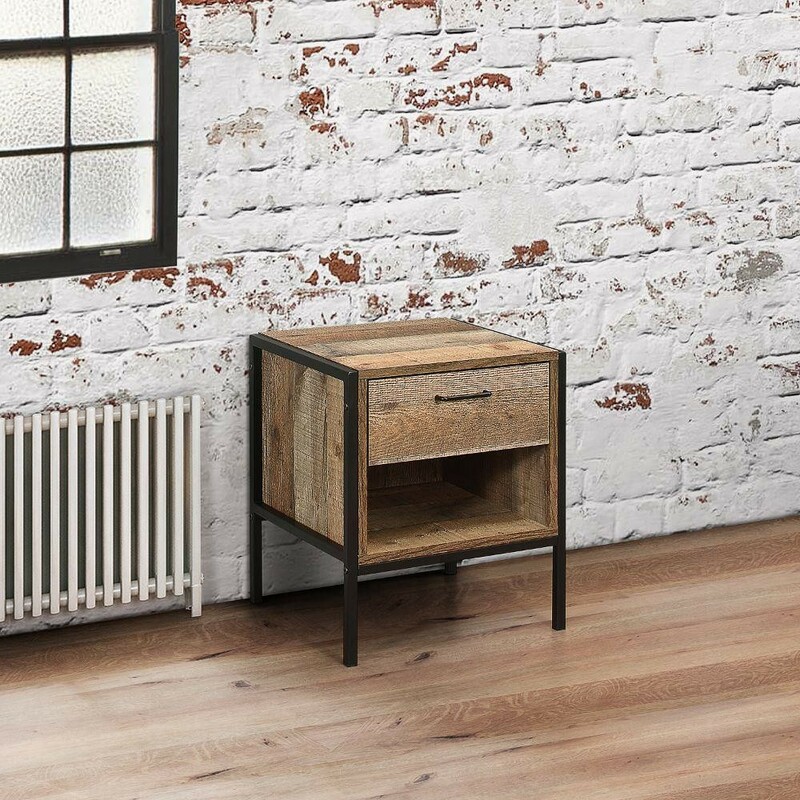 The industrial Urban 1 Drawer Bedside is suitable for modern living, with plenty of space for all the gadgets and essential bedside items you could wish for. The industrial design of the Urban 1 Drawer Bedside will modernise any interior space. Matching the metal frame, simple lines and rustic colouring of the wood-effect table, drawer and shelf works perfectly. This bedside table is fantastic for storing all your essential items, whether you'd like them on display or stored away in the drawer to help keep the bedroom feeling tidy and clutter-free. Fed up of having a messy bedside table? Upgrade your bedroom with a table that is compact, spacious and practical in an industrial style. Take care of the drawer by wiping down regularly with a soft, dry cloth. Complete the industrial chic styling of your bedroom with the entire Urban Collection! The product is part of the Urban Wooden Bedroom Furniture Collection.